Last week on FATD, we featured the BMW E21 3-Series, a German car that was overshadowed by its more famous predecessor and successor. This week, we focus on a German car that was eclipsed by the car that was designed to fight it. The E30 M3 is idolized and lusted after by millions of people, to the point where its value has skyrocketed to somewhat absurd levels (though those might be falling off a bit.) But everyone always seems to forget the car that inspired it — the Mercedes-Benz 190E 2.3-16. This was a "factory hot rod" version of the compact Mercedes-Benz W201 that was developed in the late 1970s. Created with the help of Cosworth, the result was a car that dominated endurance racing and set new records. 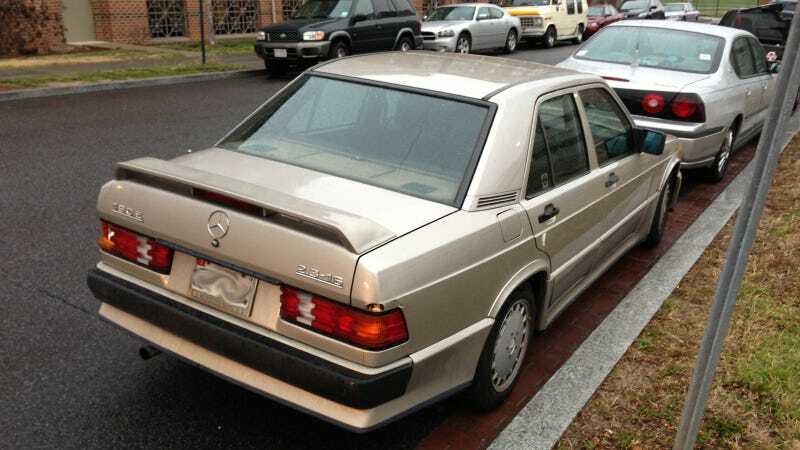 For a time, it was THE German sport sedan to have. That's why I was thrilled to see someone apparently daily-driving this one. I saw it near the Marine Barracks a few weeks ago and I immediately knew I had found something special. Besides a couple cosmetic dings, particularly a broken tail light and a nearby dent where it looks like someone hit it coming out of a parking spot, this 190E 2.3-16 appeared to be in decent shape overall. I love the styling of Benzes from the 80s, but this one is especially kickass. It's a very aggressive kit compared to the more pedestrian standard 190E, what with its fender flares, unique bumpers and tidy rear spoiler. It looks like it's just waiting to hit up a touring car race when its owner gets off work. As its name implies, this one packs a 2.3-liter, 16-valve four-banger good for a healthy 185 horsepower (167 in U.S.-spec trim). Also, it has a dog-leg gearbox! How cool is that? You never see those anymore. As always, your guess is as good as mine as to what year this one is. If you want to learn more about the hotted-up 190E, watch this video from Automobile where they test it against the E30 M3. I don't really think you can go wrong with either of those cars. Which one would you choose?